Make a tight fist, and notice how the muscles and tendons in your forearm tighten. Unclench the fist, and your forearm loosens up again. That's important knowledge for your golf swing. Grip the club tightly, and your whole swing will become taut and stiff. Your arms will not move freely, your shoulders will tend to tilt rather than rotate, and you'll have trouble squaring the clubface to the ball. At best, you'll rob yourself of power. At worst you'll develop a horrendous slice. Grip the club lightly, however, and you'll be taking the first and perhaps most important step toward a rhythmic, free-flowing swing. I particularly recommend this when you're playing into a headwind, where the common tendency is to tense up for a big, hard swing. 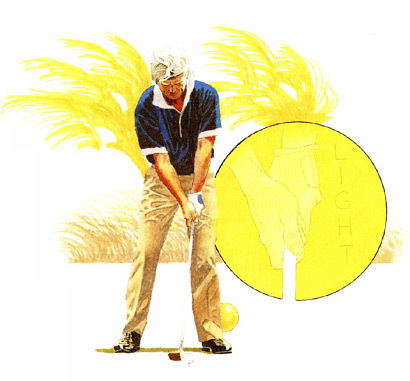 Instead, no matter how hard the wind is blowing, keep a light hold on the club. It's a nice way to fool Mother Nature.